On returning to Ruhengeri, I moved into a house with Patrick Uwineza and Akhim Abdul. Patrick is the owner of Top 5 SAI studio’s. His right-hand man Akhim works at the company in exchange for accommodation, food & school fees. By background, one is a Hutu Catholic and the other a Tutsi Muslim. They are both orphans and have been best friends since meeting 14 years ago. The ‘Youth against AIDS Association’ (AJSCS) is another project of Patricks’, and has being going for about 10 years. A group from the AJSCS student committee organized an afternoon of drama and dance about the AIDS subject in a distant mountain village. Embarrassingly there were more eyes on me for the first hour than there were people watching the performances. The students thought most of the kids in the village had not seen a white person up close before, so it was better for them than telly. Growing bored eventually, I was left in peace to film the performances, but not before appreciating yet another completely random santa hat wearer. The boy in the top-right definitely had the best view of the performances. At the home of Jadiette with a delicious feast of chips, fresh avocado, dodo-tomato and rice. Plus an omelette courtesy of the hens running freely through the house. Spectacular views of Lake Ruhondo in the north of Rwanda. I felt pretty lucky and also guilty this day, as we drove in the luxury of a UNICEF 4wheel drive past people lugging huge weights of firewood around the Northern Lakes region. AJSCS were in the process of applying for funding from UNICEF. To assess its viability and impact in remote areas, we spent a week with two national UNICEF reps going from one end of the region to the other, interviewing local government officials, school students, members of the community and teachers. The mayor of the Burera region takes notes as Patrick talks with students and UNICEF reps about how the association can improve it’s reach in rural areas. 1.Patrick enjoys a day out with the UNICEF women. 2. Discussing successes and failures of the organisation with students in Cynika district. 3. At the office with Felo who is in charge of organizing placement of AIDS orphans within local families. 1. Patrick gets enthusiastic with the teenagers in Burera district. 2. A marriage proposal from a 15-year-old lad at one of the Burera district schools. Neighbours from the corner; he is mostly blind but still a beautiful sewer. Clara’s Engagement Party was quite an affair. In keeping with Rwandan custom, the family of the groom have to go to the home of the bride and pretend to make ‘enquiries’. The bride’s family is responsible for providing food, soft drinks and gallons of local beer for the meeting. The bride, along with two of her sisters then appear wearing similar outfits, and the grooms’ family pretend to be choosing one as a suitable future wife for their sons. Negotiations are play-acted out over a week or so, before the couple are officially announced as engaged. The groom himself does not get to attend this ceremony, but in exchange for the day’s festivities, his family are responsible for organizing and funding the actual wedding. 1. Annieke and I try to keep out of the mud, and out from under the feet of the organisers. 2. Preparations in full swing. 3. The groom’s family begin to arrive from Kigali. 4. Snoop and Janvier wait for the speeches to kick off. Clara with an assortment of sisters and friends, waiting patiently for her special ‘appearance’ at the ceremony. Up until this day Clara was a devout Catholic. But in Rwanda a bride must align herself religiously with her groom; so the engagement ceremony was also her first step to becoming a Muslim. Chantelle, Clara & Zaina await to hear who the family will choose to marry Clara’s fiancé. Mountains of food being dispatched to the mountains of people who turned up. (Some invited, most not). Old men and women are held in the highest regard in Rwandan culture, and they get first dibs on food. 1-3. Children and adults alike enjoy the local sorghum beer brewed especially for the celebrations. 4. Mannassieh, Frank & Modeste get dressed up for the occasion. It is a show of wealth and status if you are able to feed everyone who turns up to your party. Unfortunately, this also means everyone in town shows up to every party they hear about in the hope of a free meal. Clara’s engagement quickly went from an expected 80 family and friends to about 400 hangers-on. The children were all getting drunk and making so much noise that nobody could hear the official speeches. 2. Every house on the street lends whatever they can for the day, be it furniture, pots or plates. People start to trickle into the concert hall for Jack B’s album launch. It turned into a marathon 9 hour concert with more than 20 local artists performing. After a few album launches, I came to realise this was the norm. Ryder Man and Neeson perform a show-stopper to wrap up the night. National elections had just been held when I returned in late August, and the ruling RPF party was holding victory celebrations around the major towns. My office backed onto the Musanze concert hall, and it gave me a giggle one day to walk in on a government party in full swing, with my own name booming over the loudspeaker in a song by Da Twin B. 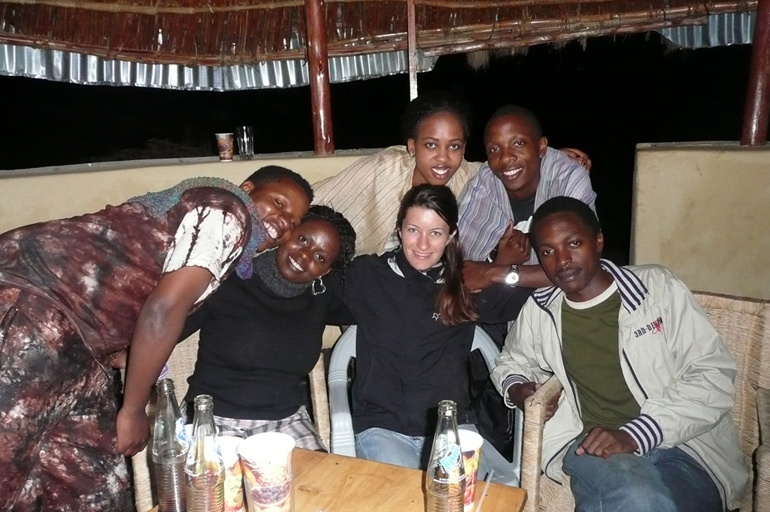 A bizarre night at a concert in Gisenyi. The gig was being run by heavily-armed soldiers along a beautiful sandy beach on the shores of Lake Kivu. On the way from Ruhengeri to Gisenyi the road was lit up from glowing hot lava which flowed down Mount Nyiragongo. Just eight years ago the volcano erupted, killing a number of people and demolishing almost half the city of Goma in the Democratic Republic of Congo. Some of the kids from our street who would follow me into town and back everyday yelling ‘Good morning mzungu, how are you, see you tomorrow!’ and eventually after learning my name (Charlottie as it is pronounced in Ikinyarwanda), would run after me yelling “Good morning Lottie!”. The next-door neighbours take a rare opportunity to dry some washing, while Obama’s big brother shows off to the camera. On location scout in Kinigi. I opted to mind the car while Albert and Patrick raced into a house to meet someone. The local children went a little crazy trying to get into the car to say hello. Filming at the Kinigi Culture Centre. Zaina’s wedding. Another huge affair. About 700 people, 3000 bottles of fanta and coke, and a tiered cake with inbuilt fireworks. The Mosque and other related buildings were not big enough for the event, so it was a Muslim wedding held in a Catholic church. The ceremony went for 5 hours. After the wedding, the girls rallied together for a dance. This caused much laughter for all as apparently I dance ‘like a Chinese’, and need to ‘fatten up my backside’. I was given a pastry as a present after the birthday dinner of Goat kebabs. It’s tradition to be fed by someone else first, then to hand-feed a bite of the pastry to everyone else. Jean-Luc and Placide enjoy watching Junior struggle to get a decent bite. Patrick, Chantelle and The Bless line up for some arm-wrestling. Back at Eden Resort a few weeks later for some monopoly and fizzy. 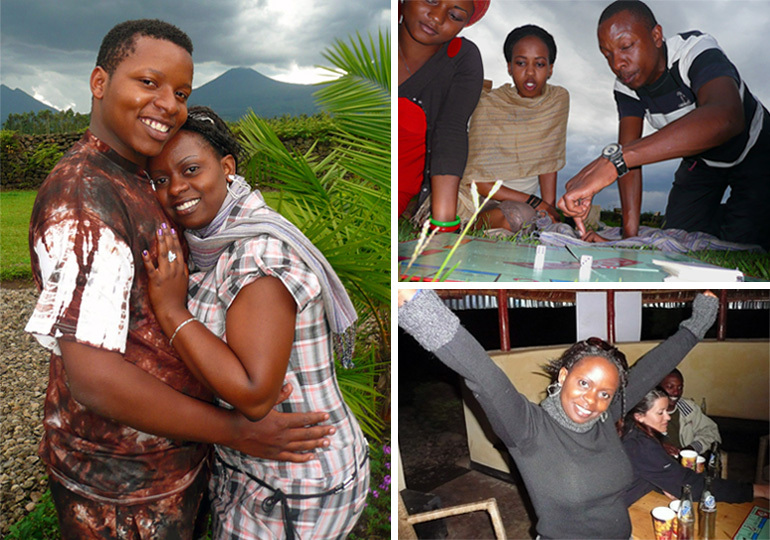 Richard and Jo from Kigali enjoy the weekend of relaxation in Ruhengeri. Jo had an especially good time after winning Monopoly!